Question: I have a gardenia bush that is steadily going downhill. It has only a few leaves, lots of strange growth on the branches, and most of the leaves have a green center and yellow edges. I’ve included three photos for you to look at. How should I care for this plant to bring it back to health? Answer: This old plant apparently needs some care. There are a lot of lichen* growing on the trunks and stems. While they do not hurt the plant, it is a sign that the plant is continuing to decline. 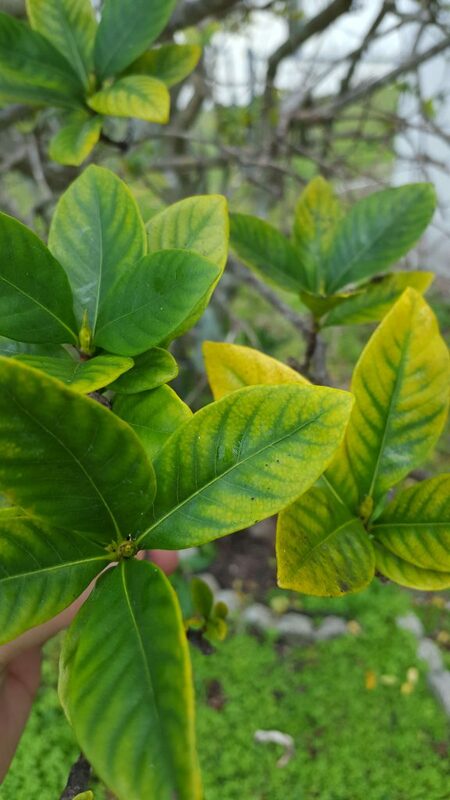 This time of year even the leaves of healthy gardenia plants may turn yellow and some defoliation can occur. By March, these healthy plants will have recovered and should begin to initiate seasonal flower buds. The immediate area around the plant should be free of weeds. The plant will also needs to be pruned, and fertilized to help it to recover. Now is the time to remove weeds from around the plant. Do that up to three feet away. Replace the weeded area with a small-sized organic mulch. Next, prune in February removing dead wood and cutting into live wood to help to stimulate growth at the cut ends. Gardenias are usually fertilized in February and October. An observation of the leaves indicates that your plant is magnesium deficient. Fertilize it in February, a couple of weeks after pruning, then again in May and October. Consider using a fertilizer dissolved in water and apply it as a liquid around the base of the plant. During this dry period, be sure the plant is adequately irrigated. Finally, keep an eye out for insects that may encroach on the budding and opened flowers. *Lichen consist of a fungus and an alga growing together in a mutually beneficial relationship. The fungus obtains water and minerals from the air and the material it is growing upon and provides structure and protection for the alga. The alga provides carbohydrates and vitamins the fungus needs to grow. The relationship does not hurt the plant host. ← Q and A: Can you shed some light on why our laurel oaks drop their leaves at different times? I am the horticulture extension agent in Lee County, southwest Florida. Contact me on most landscape issues including native plants, flowering trees, plant identification, and insect and disease problems.